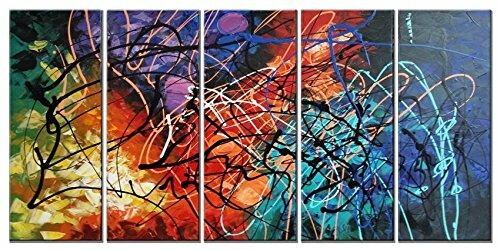 5 pcs stretched and framed canvas oil paintings set ready to hang for home decorations wall decor, each panel has a black hook already mounted on the wooden bar for easy hanging out of box. Authentic Wieco Art canvas home art are packed in carton box with Wieco Art logo printed on each box. Hot Selling oil or Acrylic paintings on canvas, A perfect wall decorations oil paintings for living room, bedroom, kitchen, office, Hotel, dining room, bathroom, bar etc..